Can a Kite Show Where We Flood? This blog is re-posted from Publiclab.org. 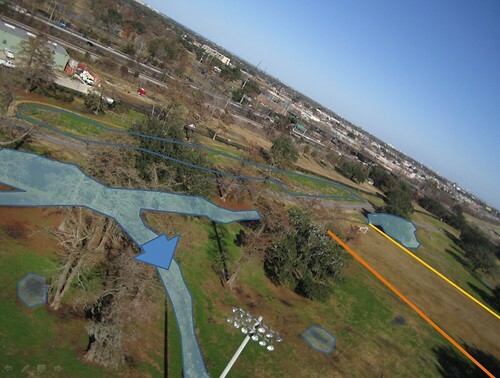 Make a kite map of city park after a winter rainstorm, to capture where the water sits on the site where city park installed a stormwater wetland. I want to check where the water sits, whether it is drained away from the cycletrack and the roadway, and find sites where stormwater wetlands could be installed. 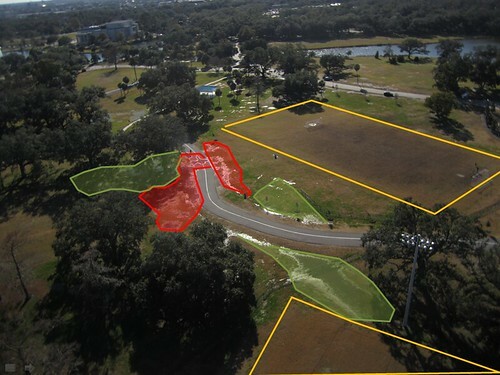 Using Publiclab.org kite monitoring techniques, I wish to monitor a wetland and park project to see how it is changing the landscape. 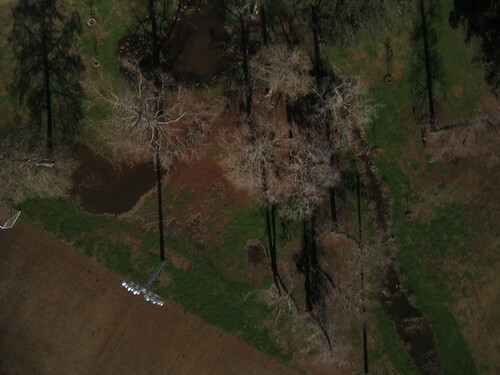 Although I could fly over the site with an airplane, or quad copter, a kite is a low-cost method of getting the aerial perspective needed to communicate and advocate for changes to our landscape. 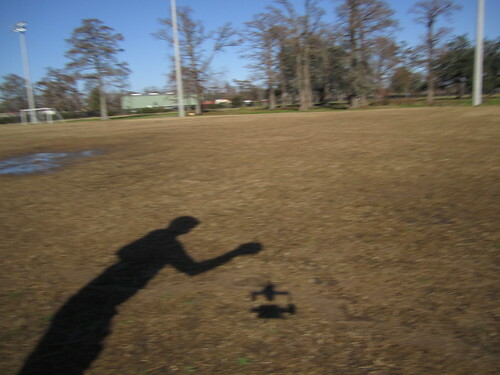 I flew the little bear kite on 100lb test in high, gusty wind over the soccer field. I used the RC picavet to direct a Canon 1400 camera rigged with a knot and tape to capture images and direct the obliques. I am a bit proud of flying a shaky, unstable kite in high wind in my right hand while directing the RC unit on my knee with a left hand. not for beginners. I flew on 11th january, in high and gusty winds. 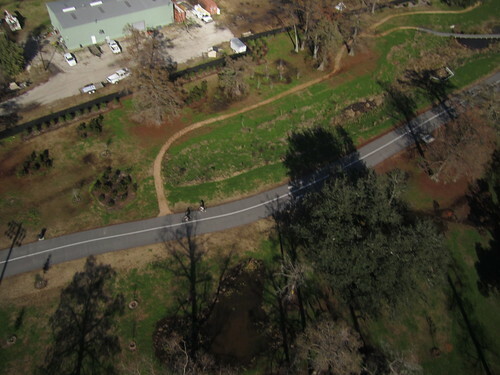 Imagery of the stormwater wetland shows that it is dry, and the cycle track nearby is also dry. 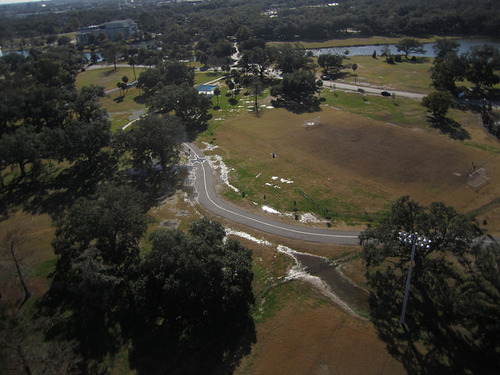 However, the stormwater wetland is drained. The pond area, although planted with wetland plants, is being colonized by clover and other weedy species. This site may drain too well to ensure the dominance of wetland species as habitat, and benefits are not being maximized. More images of the wetland built at the south drain show that this wetland is located to retain water even more effectively, slowing it down before it hits the drain. at this site, many wetland plants colonize the standing water, including many wetland trees. In this image, much water is seen pooling in an area planted with wetland plants. Bald cypress trees are the bare trees. The west arm of the cycle track is flooded on either side of the track. 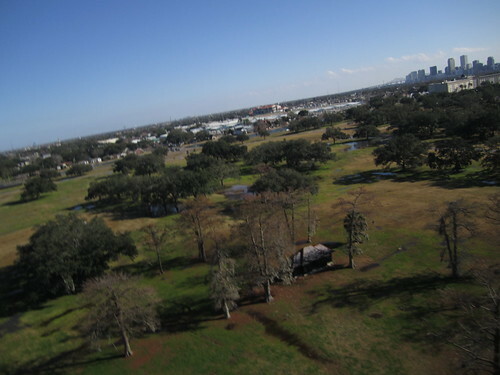 This is likely due to recent grounds improvements for voodoo fest and jazz fest. The site of these "festival grounds" is used as a soccer field during the off season. Fill material was placed in these areas, pushing more water into adjacent areas. as well as other locations, to draw water away from constructed features that are desired to be dry (and that could be damaged from regular expansion and contraction of water), while retaining that water in the ground overall. orange areas= new festival grounds /soccer fields, filled, graded, displace the normal groundwater storage. green areas= areas where water is pooling where pooling might be acceptable; these sites could be enhanced into wetlands to increase water retention, hopefully to drain water away from red sites while keeping water on the site in general. A map stitching is up on mapknitter. GRN's flood less campaign, there's a need to bring awareness to new orleans' wet situation and the ability for alternative infrastructure to mitigate flooding. Citizens can monitor their own environment with low cost tools, like kites, to obtain information that lead to improvements. Scott Eustis, M.S. is a Public Lab organizer and GRN's Coastal Wetland Specialist.